MONDAY-FRIDAY 9:00 a.m. 6:00 p.m. 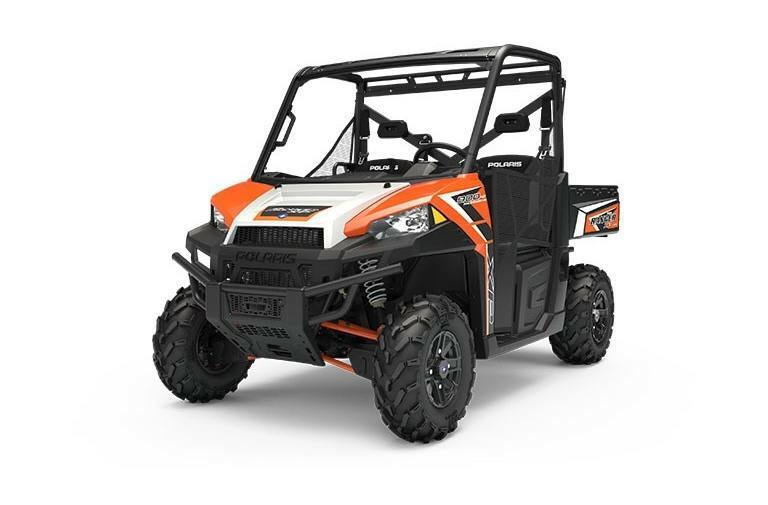 The Best Selling Utility SXS: With legendary performance and the best ride and handling on the market, RANGER XP® 900 is equipped for the toughest jobs and terrains at an unbeatable price. Power To Tackle Any Job: Our 875cc ProStar® 4-stroke twin cylinder engine is purpose designed and built to deliver 68 HP of smooth, reliable power. Combined with Electronic Fuel Injection (EFI) and True On-Demand All Wheel Drive, you'll have all the power and traction you need to get the job done on any terrain, in any weather. Haul More. Work Harder. Get More Done: Hook up your trailer to the standard 2" receiver hitch and tow up to an impressive 2,000 lb. of supplies for a long day of work on the property. Load up to 1,000 lb. in the gas assist cargo box and let your RANGER do the work for you. Incredibly Smooth Riding & Handling: With 10" of up-front and independent rear suspension travel, 12" of ground clearance for tough terrain, and a refined cab experience, the RANGER XP 900 delivers all-day riding comfort — whether you're on the trails or working on your property. Work In Comfort: The RANGER XP® 900 delivers the performance and comfort you need for all-day tasks around the property. This workhorse is equipped with the customizable options and features needed to tackle any job. VersaTrac Turf Mode: For work around the house, unlock the rear differential for easier and tighter turns that won't tear up your lawn. Rider-Centric In-Cab Storage: For your smaller, but necessary items, take advantage of the 9.8 gal. of easy-to-access in-cab dash storage. Best-In-Class Payload: The RANGER XP 900's massive 1,500 lbs of payload capacity will help you tackly the big jobs or haul all of your gear for the big hunt. Easy Maintenance: Designed so you can easily maintain the vehicle with minimal service appointments. Change your oil and check the engine with just a few simple steps. Standard 2" Receiver Hitch: Connect your trailer to your RANGER with the standard 2" receiver and maximize the impressive 2,000 lb towing capacity. Versatile Cargo Box: Haul up to 1,000 lb. with the gas assist cargo box with room for a full-sized pallet. 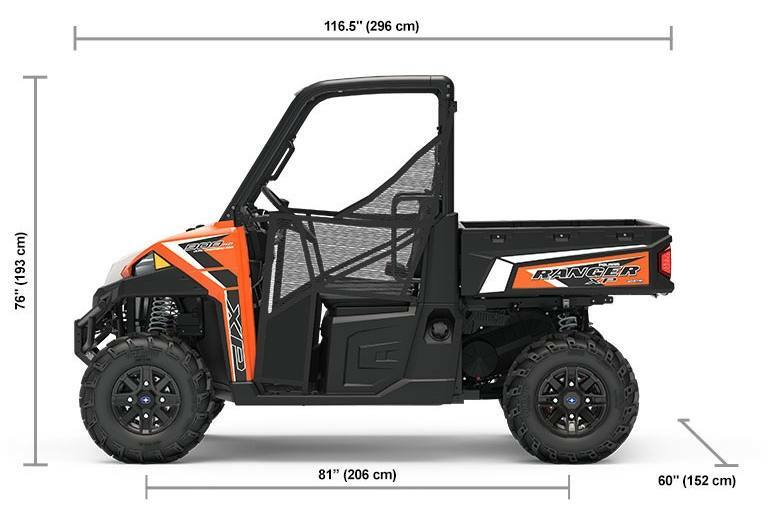 Take advantage of the Polaris Engineered Lock & Ride® accessories line-up for versatile box configurations. The Polaris RANGER® can be hazardous to operate and is not intended for on-road use. Driver must be at least 16 years old with a valid driver's license to operate. Passengers must be at least 12 years old. Drivers and passengers should always wear helmets, eye protection, and seat belts. Always use cab nets or doors (as equipped). Never engage in stunt driving, and avoid excessive speeds and sharp turns. Riding and alcohol/ drugs don't mix. All drivers should take a safety training course. Call 800‑342‑3764 for additional information. Check local laws before riding on trails. ©2019 Polaris Industries Inc.
*Offers vary by model and are subject to availability. 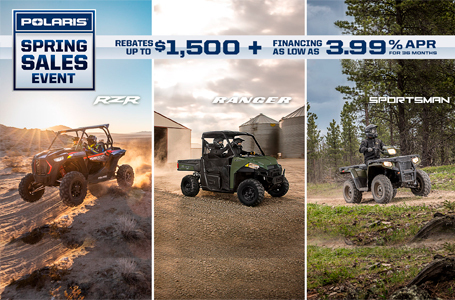 Rebate and financing offers valid on select 2015-2019 new and unregistered Polaris® RZR®, RANGER®, Sportsman®, GENERAL®, and ACE® models purchased between 3/1/19 - 4/30/19, but availability of the offers and the offer terms may vary by State, so see your local authorized dealer for complete details. †Rates as low as 3.99% APR for 36 months. Examples of monthly payments required over a 36-month term at a 3.99% APR rate: $29.52 per $1,000 financed; and with a 60-month term at a 6.99% APR rate: $19.80 per $1,000 financed. An example of a monthly payment with $0 down, no rebate, an APR of 3.99% APR for 36 months at an MSRP of $12,699 is $374.87/mo. total cost of borrowing of $796.27 with a total obligation of $13,495.27. Down payment may be required. Other financing offers may be available. See your local dealer for details. Minimum Amount Financed $1,500; Maximum Amount Financed $50,000. Other qualifications and restrictions may apply. Financing promotions void where prohibited. Tax, title, license, and registration are separate and may not be financed. Promotion may be modified or discontinued without notice at any time in Polaris’ sole discretion. 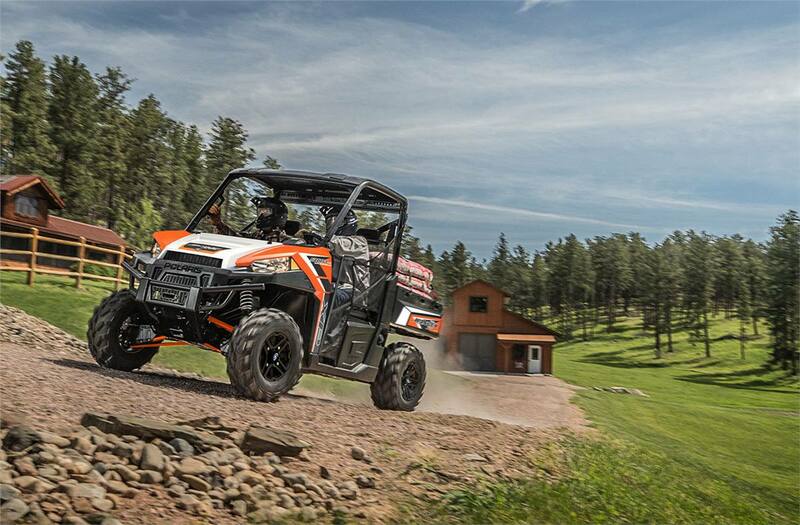 WARNING: Polaris® off-road vehicles can be hazardous to operate and are not intended for on-road use. Driver must be at least 16 years old with a valid driver’s license to operate. Passengers, if permitted, must be at least 12 years old. All riders should always wear helmets, eye protection, and protective clothing. Always use seat belts and cab nets or doors (as equipped). Never engage in stunt driving, and avoid excessive speeds and sharp turns. Riding and alcohol/drugs don’t mix. All riders should take a safety training course. Call 800-342-3764 for additional information. Check local laws before riding on trails. ©2019 Polaris Industries Inc. RESTRICTIONS: ONLY ONE (1) COUPON PER CUSTOMER CAN BE SUBMITTED. THE COUPON CANNOT BE USED IN COMBINATION WITH ANY OTHER COUPON OR OFFER. MAXIMUM COUPON VALUE OF $175 (US OR CANADIAN DOLLAR). PURCHASE A PRO ARMOR® WHEEL & TIRE SET AND RECEIVE $150 (US OR CANADIAN DOLLAR) OFF. PURCHASE $150 (US OR CANADIAN DOLLAR) WORTH OF POLARIS® APPAREL ITEMS AND RECEIVE $25 (US OR CANADIAN DOLLAR) OFF. VALID FROM MARCH 1 – APRIL 30, 2019. OFFER VALID FOR POLARIS BRANDED APPAREL PRODUCTS, AS WELL AS RANGER ®, POLARIS GENERAL®, RZR ®, SPORTSMAN®, POLARIS ACE® PRO ARMOR® WHEELS & TIRES SETS WITH POLARIS® PART NUMBERS. PHYSICAL COUPON WITH VALID CODE MUST BE PRESENTED AT TIME OF PURCHASE FOR DISCOUNT TO APPLY. DEALERS AND EMPLOYEES ARE NOT ELIGIBLE FOR THE DISCOUNT. NOT VALID ON NON-POLARIS PRODUCTS OR AFTER THE EXPIRATION DATE. WHILE SUPPLIES LAST. THIS OFFER MAY BE DISCONTINUED OR MODIFIED AT ANY TIME BY POLARIS®. OFFER AVAILABLE ONLY IN THE U.S. AND CANADA. BY SUBMITTING THIS COUPON WITH YOUR NAME AND EMAIL, YOU AUTHORIZE AND CONSENT TO POLARIS® AND/OR ITS AUTHORIZED DEALERS CONTACTING YOU VIA PHONE, EMAIL, DIRECT MAIL AND OTHER FORMS OF COMMUNICATION ABOUT POLARIS®, ITS PRODUCTS, OFFERS, OR MARKETING MATERIALS. DEALER INSTRUCTIONS: THIS IS A POLARIS® OEM COUPON. FOR REIMBURSEMENT INSTRUCTIONS, LOG-ON TO YOUR POLARIS® DEALER WEBSITE. GO TO “NEWS, FORMS, & LINKS” UNDER THE QUICK LINKS HEADER. SELECT PG&A TO VIEW “2019 SPRING SALES EVENT COUPON REDEMPTION INSTRUCTIONS” AND “2019 SPRING SALES EVENT QUALIFYING PART NUMBERS”. ALL REDEMPTIONS WILL BE CREDITED TO DEALER PARTS ACCOUNT. ALL REDEMPTIONS MUST BE SUBMITTED ENTERED BY MAY 15, 2019 OR EARLIER. TRADEMARKS ARE THE PROPERTY OF POLARIS INDUSTRIES INC. © 2019 POLARIS INDUSTRIES, INC.
MONDAY-FRIDAY: 9:00 a.m. - 6:00 p.m.